Vocabulary – D-D-Do you love me? The laptop is on hiatus, so I’m writing this at lunchtime on my work computer. My power supply quit and I have had to wait until payday (tomorrow) for a new one. I’m in pure hell. D is for despot, dormancy, deliciousness (root beer, Papa Murphy’s pizza, cheese of any kind except blue, and chocolate), Daleks (if you’re a Doctor Who fan), and dependent, which is what I am on my laptop. Gah! Daguerreotype – an early photographic process using chemical reactions on a silver or copper plate. Often confused with tintypes. If you write historical fiction, you should know the difference. 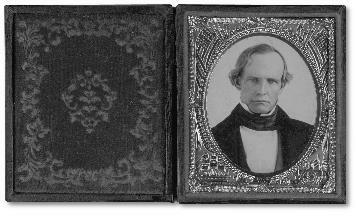 From the linked website – daguerreotype in open case. Denouement – falling action after the climax of a literary work or film. This is the part that wraps things up. After the criminal is unmasked and taken into custody, Scooby and the gang head to the malt shop to rehash the case over a chocolate coke float. Dhole – Also known as the Asiatic wild dog, dholes live in eastern and Southeast Asia, including the Himalayas, parts of India and Siberia. They live and hunt in packs and look something like a red-headed coyote. Lots of neat pictures and information here. Dilettante – person who shows an interest in art, science or another body of knowledge, but only a superficial one. A dabbler. Margaret wrote poetry, the lovelorn, shallow observations a young student might pen upon completing a required course. She liked to do this beside her lace-clad window in the early evening, the sash raised to admit birdsong and a glass of sherry nearby. She hoped Mr. Eckert would ride by and see her there, and perhaps be moved to stop. Silly Mr. Eckert. He told her once she was a dilettante. “When you’re serious about something, Miss Margaret, drop me a line,” he said. He was so staid! DJ – short for disc jockey, sometimes spelled as deejay. Originally the guy who played records over the radio, accompanied by patter and announcements. The term has been credited to commentator Walter Winchell. The letters DJ now stand in for the words. Dorp – a village. A village of derps, perhaps? Draconian – unusually rigorous or cruel, as in laws, rules or punishments. From Draco (650 BC), a 7th-century lawmaker who established a harsh code of law enforced by courts. “Don’t you think cutting off Cordelia’s head for insulting a demon is a bit draconian?” Buffy said, brushing vamp dust off her stake. “Where did you learn such a big word?” Giles mused. Dugong – an herbivorous mammal related to the manatee, of the order Sirenia. 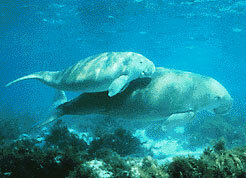 Momma and baby dugong. Aww. Dwarf – a person of small stature caused by varying medical conditions. Dwarfs prefer to be called little people. Primordial dwarfism results in extremely tiny, though proportionate, people with a characteristic look to their facial features. Lucia Zarate (1864-1890) was the first person identified with primordial dwarfism. Like many unusual people in her time, she traveled with a circus sideshow. With a few environmental modifications, little people can live normal lives, provided they don’t have serious medical problems. I would love to see a book with a little person protagonist. There may be one or two; I don’t know. If you know of one, please share in the comments. Dystopia (dystopian) – In fiction, a dystopia is a nightmare world, the opposite of an ideal society or setting, characterized by authoritarian governments, substandard living conditions and a population that preys on each other instead of cooperating. They don’t have to be science fiction but often are. George Orwell’s 1984 is the most famous dystopian novel. Others include John Wyndham’s The Chrysalids, Margaret Atwood’s The Handmaid’s Tale and Ray Bradbury’s Fahrenheit 451. I have read all the books listed and highly recommend them. That’s all for now, folks. Go read something! Another dalliiance spent reading the remarkable story of Lucia Zarate. Like I don’t have anytihing else to do. 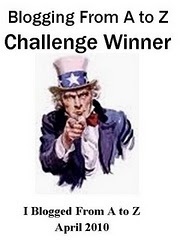 But that story was on a pretty cool website that I saved for another time when I can fritter away more time. Such fascinating stuff! That was pretty interesting, wasn’t it? I love putting links in my posts. Why should I be the only one wasting time surfing around? It’s my evil plan! Ha ha! Dazzling array of d-words Elizabeth. It’s amazing how attached we are to our computers. Ain’t it the truth, Wanda! I got spoiled by using the laptop on the couch and now it’s extremely hard to sit at the desk and use my ancient Insignia desktop. Why didn’t I buy a comfortable chair when I was flush? !